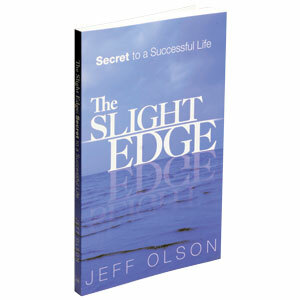 One of the best books I have read this year on personal development is Jeff Olson’s, The Slight Edge. It’s a very easy read with a very simple philosophy. Olson hits home that success is reached in baby steps. There is no magic pill or mythical technique that’s going to make you an overnight success. Olson states that all the successful leaders and gurus you admire all have one thing in common, they have a Slight Edge. The Slight Edge is the ability to do small, easy, simple and sometimes boring task in order to reach your definition of success. This is reached when your efforts each day has compounded over time to get you your desired results. One of Olson’s favorite example is about health. People often are discouraged with their weight loss plans because they do not see results fast enough. According to the Slight Edge Philosophy if they do the small things like eating right and exercising regularly they would see weight loss. This Philosophy applies to all aspects of your life. From business to health to personal matters you are always making a Slight Edge decision. Every decision either has you working toward success or toward failure. Understanding this concept was my “Ah ha moment.” Each decision that I make allows me to get closer and closer to success. Each poor decision I make leads me toward failure. Every decision I make matters one way or the other. That is very powerful when you really think of it. Success is completely in your hands. The book is a must read before you start any new endeavor even if you want to start over. Many of us have heard it all before from those pep rally live events where you are drilled that if you just believe in what you’re doing then you will see success. We get so excited when we get home but overtime that cheerful business spirit diminishes. Olson says that where the problem lies is that people do not have a way to process the information that they receive. Information from training seminars, from school, from work, from our spouse, and from our community is all placed in one big bag and we do what we can to give attention to all areas of our lives. And because it’s a lot of information we are not constant with processing that information. The Slight Edge Philosophy gives you the advantage against feeling overwhelmed by all that information. With the process of doing the small task today and having your efforts pay off tomorrow. The Slight Edge emphasizes taking action and getting started. Many of us try to get ready to get ready and lose a lot of time at the drawing board. If the circumstances are not just right we will not budge. You are not perfect and nothing is, so stop wasting time. Your success journey begins when you start. This Philosophy really does work because the concept is very simple utilizing easy task. Your task could be as easy at setting aside 30 minutes for a workout. That same task is easy not to do because of our 101 excuses for why we can’t do it. Olson explains in the book that leaders are successful because they chose to do what others won’t do. Leaders do the opposite of what others are doing. While America’s obesity epidemic grows leaders are exercising regularly. While the economy crashes leaders are not waiting for a bailout. Leaders take responsibility for their part in any situation. They are not in the business of blaming they are in the business of progressing. You have heard of the ole saying “Slow and steady wins the race.” This is the bases of the Slight Edge. Just a little bit each day toward your goals will get you big rewards. That can come in way of a 5-Figure check, a healthier body, a college degree, a better marriage or anything else that is important to you. At the end of each day choose to make a list of what you have done for the day. This will help you see where you put most of your time and energy into. In what direction are you going? Make changes to get back on track. When you set your goals using the Slight Edge there is no limit to your success. Click Here To Access FREE Videos That Will Help You Skyrocket Your Business This Week! The Slight Edge is a good book indeed. I didn’t like it at the start, but along the chapters there a few things I learnt about myself. Thanks for the review.